Karnataka Co-Operative Milk Producers Federation Ltd. (KMF), has been producing and selling milk and milk products, since 1985, under their mark ‘NANDINI’ which had been registered under Class 29 and Class 30. M/S. Nandhini Deluxe is in the business of running restaurants since 1989 under the name ‘NANDHINI’ and had applied for the registration of the same. Products sold under the infringing mark ‘NANDHINI’ (Restaurant) were of the same classes as those under ‘NANDINI’ (KMF). In 2015, the proprietors of ‘NANDHINI’ (Restaurant) appealed to the Supreme Court against the decision of the High Court. It was deceptively similar to the mark of the respondent and was likely to deceive the public or cause confusion. KMF had long and sustained use by the ‘NANDINI’ and had acquired a distinctive character and was well-known to the public. The public associates ‘NANDINI’ with ‘NANDHINI’ because of phonetic similarity. ‘NANDHINI’ was adopted by the restaurant chain to ride on the goodwill of trade mark ‘NANDINI’ (KMF). It was running the business of restaurant since 1989 and KMF had started using mark ‘NANDINI’ since the year 1985 only for milk and milk products and not for other products. Goods and services of ‘NANDHINI DELUXE’ were totally different from that of the KMF and, therefore, there was no likelihood of confusion or deception among the public. The monopoly under a Trademark only extends to the goods which are falling in a particular class and not the entire class of goods and the trade mark which is similar in nature can be registered for the goods which are falling within the same class but are not identical to those of the previously registered mark. The Hon’ble Supreme Court granted the registration of the mark ‘NANDHINI’ by the restaurant on the condition that registration will not be given to them for milk and milk products. While the goods of both parties fall under the same classes (i.e. 29 & 30), the goods of the parties differ from each other. One (NANDINI) was concerned with the production of only milk and milk products while the other (NANDHINI) dealt in fish, meat, poultry and game, meat extracts, preserved, dried and cooked fruits and vegetables, edible oils and fats, salad dressings, preserves etc. Furthermore, ‘NANDHINI’ had also relinquished its claim for milk and milk products. The nature and style of the business of the appellant restaurant and the respondent federation were altogether different. One (NANDINI) was a manufacturer of dairy products while the other (NANDHINI) ran a full-scale restaurant business. There’s mere phonetic similarity as far as the word marks are concerned (i.e. NANDHINI/NANDINI). However, the trade mark with logo adopted by both parties are different. The restaurant chain uses the word ‘NANDHINI DELUXE’ which is followed by the tagline ‘the real spice of life’ and a device of a lamp accompanying these words. On the other hand, the milk federation only uses the word ‘NANDINI’ beneath a ‘Cow’ logo and is encircled by egg shape circle. There is a difference in not just the visual appearance but even in their products. The manner of business is different. All of these factors make it difficult to imagine that an ordinary man would associate the goods of the Restaurant as that of the Milk Federation. The restaurant had applied the trademark ‘NANDHINI’ in respect of goods which are used in the products/services of restaurant business. Said items do not strictly belong to Class 29 or 30. Other items necessary to run their business or render their services include stationery, furniture, utensils and crockery all of which do not fall under class 29 or class 30. Thus, the goods that are dealt with under the name ‘NANDHINI’ aren’t strictly under class 29 & 30. The milk and milk products, which are sold by the respondent under the trade mark of ‘NANDINI’, fall under Class 29 and Class 30 as per classification under Schedule IV to the Trade Marks Rules, 2002. "Nandini/Nandhini” is a generic name, representing a goddess and a cow in Hindu mythology, and it is not an invented or coined word attributed to one party. Referring to the judgement in Vishnudas Trading As Vishnudas vs The Vazir Sultan Tobaccoco. Ltd. JT 1996 (6), 366 1996 SCALE (5)267, it is stated that the proprietor of a trade mark cannot enjoy monopoly over the entire class of goods especially if he is not using the said trade mark in respect of certain goods falling under the same class. Refusal under Section 11(2)(b) cannot be made because both the parties started using the marks within a span of 4 years of each other and both have built a considerable reputation with the state boundaries for themselves over the years. Thus, on all these grounds, the Supreme Court laid down that the two marks are not deceptively similar. 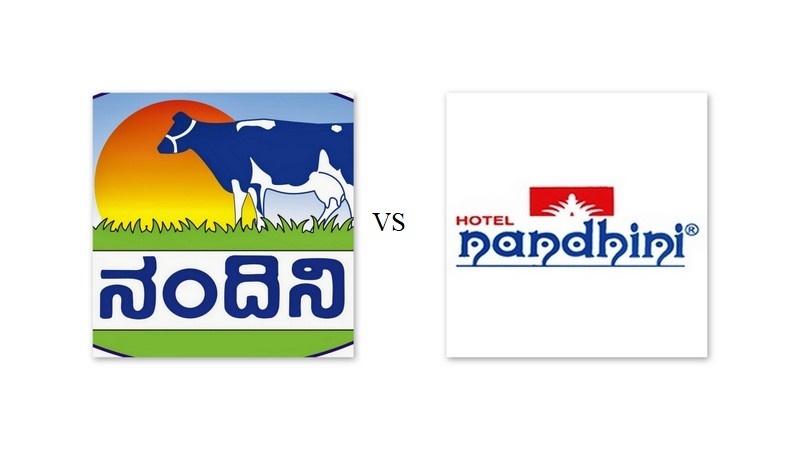 The Supreme Court thus allowed the mark ‘NANDHINI’ to be registered and used by the restaurant based on the ground that it (device/logo) is not deceptively similar to the mark ‘NANDINI’ (device/logo) used by the respondents. On the face of it, this decision may seem logically sound because denying registration on grounds of mere phonetic similarity, when the marks are visually poles apart and the products under them are also different, would be a hindrance to a healthy competition. However, it would also be pertinent to note that the court seems to have overlooked the fact that in this case, ordinary person would mean any person hailing from Karnataka or one who has lived here for a considerable amount of time. To anyone, from any other part of the country, these marks would most probably be similar and confusing. The restaurant chain operated within Bangalore and no one outside Bangalore would have plausible reason to be aware of this chain. The Milk Federation sells its products within the region of Karnataka. Hence, any one residing here for a long time would not confuse them. But, to any ordinary person from outside the city or state limits, these marks would seem to be confusing or having the same origin. To understand this conundrum better, we can look back at the case of London Dairy v Londonderry wherein the Bombay High Court ruled that mere phonetic similarity would not amount to infringement of any sort. One mark was famous for its ice cream products. The other for its boiled confectionary. Both were sweets, but one was not confused for the other because the former had built a reputation for itself nationally while the new one was distinctly viewed by the consumers as something different. The consumers were not confused because they could differentiate between the origin of the two marks and their underlying products.